Colman was an Irishman who entered the monastery of Iona. Upon the death of St. Finan in AD 661, he succeeded him as Abbot and Bishop of Lindisfarne. It was during Colman's episcopacy that the controversy concerning the correct way of computing the date of Easter came to a head. Colman led the party which favoured the Celtic method, brought from Ireland, which was practiced throughout Northumbria at that time. However, the Roman party, led by St. Wilfred, was very vocal and eventually persuaded King Oswiu to to call a great synod to discuss the matter at the Royal Deiran monastery at Whitby (AD 664). Colman spoke eloquently and, though neither side could really prove the priority of their claims, the King decided to fall in line with the Roman practices of the rest of Western Europe, including his wife. Bishop Colman resigned in protest and returned to Iona, taking with him all the Irish and about thirty of the English monks at Lindisfarne, as well as many of the relics of St. Aidan. From Scotland, these monks emigrated to Ireland, in AD 667. Colman settled on the Isle of Inish-Bofin (Co. Galway) where he founded a monastery. Trouble continued to follow the abbot, however, for the Irish monks were in the habit of leaving the monastery during the Summer at the very time when they were needed to gather in the harvest. Upon their return in the Winter, they would expect an equal share to the English monks who had done all the work. The situation caused much discord which Colman for forced to resolve by settling the English monks at Mayo instead. 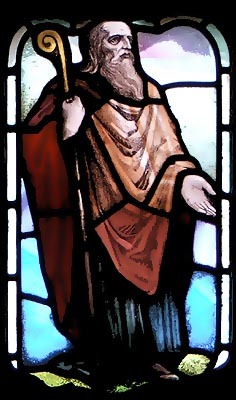 St. Colman is usually said to have died on 18th February AD 675.